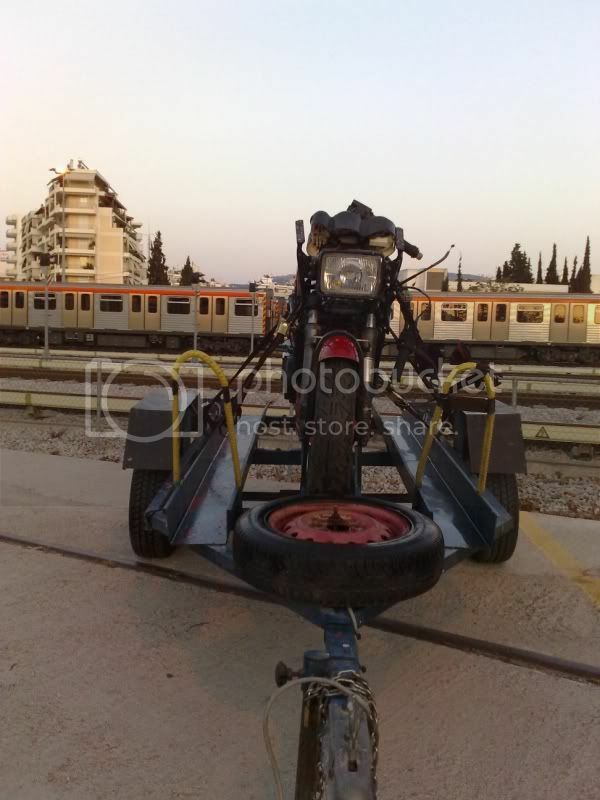 Well, hello everyone, I am Fanis from Greece, and started this thread to show my bike and share some info and the process of making it work again (it is a work in progress). The bike was given to me by a friend (thanks Bill) who is a Kawasaki maniac and somehow managed to get himself 3 KR250 A. So one day he gave me the red one. Below are pictures from the day he gave it to me. The bike is on the trailer as it was brought to me, washed only with hose and some WD40 to parts where rust had started it's appearance. 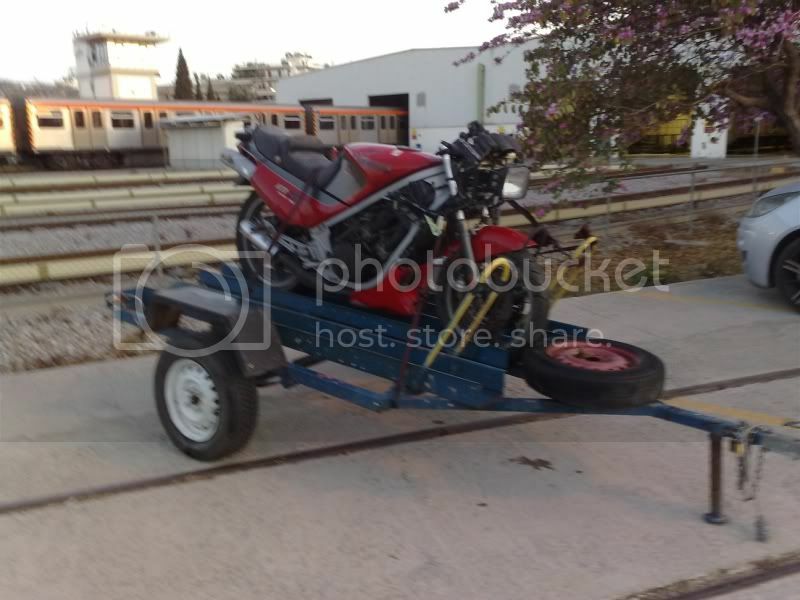 The bike was imported in Greece in 1987 as a complete bike, but never got registered. Instead it spent the long years till 2005 that Bill got it, waiting to be broken as spares. 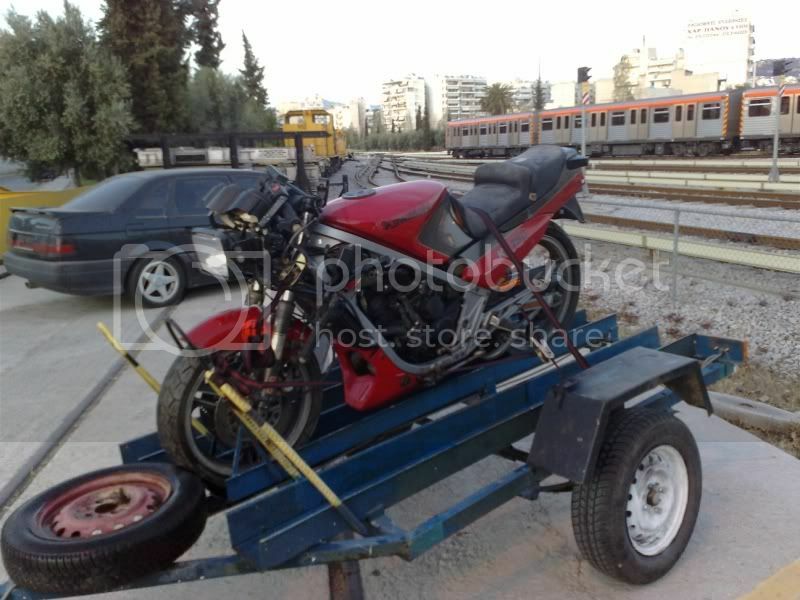 Especially after 1997 when Greece adopted the European legislation about frame numbers (16 digit number), many complete bikes were sold to be broken as spares. 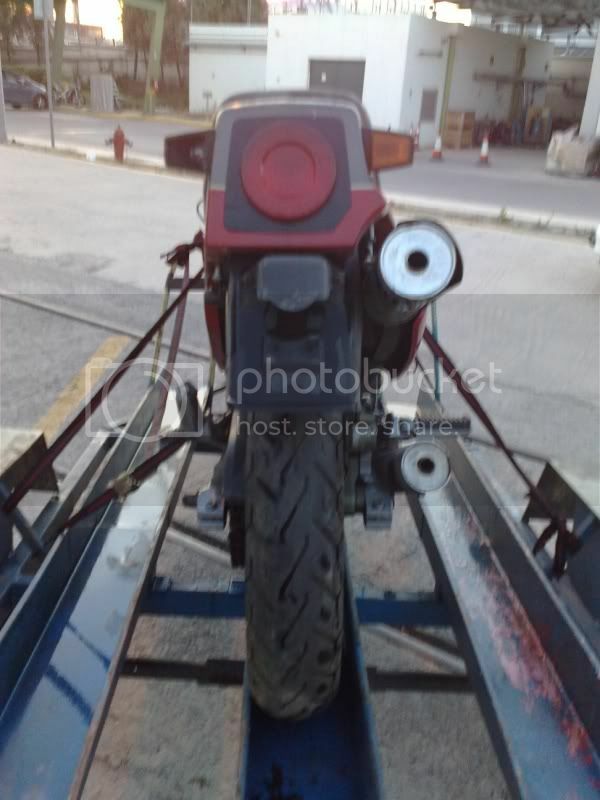 Due to sheer luck I happened to know the importer and thus I can get the original customs papers to register it as a classic bike in 2014. It needs a lot to be done to it before though. As you can see in the above pics, when I got it the bike missed the right hand clip-on, right hand footrest, rear left indicator lens and all of the front fairings. After some time I had the bike abandoned in the man cave, I decided I should give it a closer look to determine what was needed for it to get on the road again! Unfortunately, I don't have any other pics of it at the time I tore the top end (never thinking that I couldn't get a head gasket) so right now I'll only say what I found. Top end: WTF? The clock writes (if I remember correctly) 27000km, but the top end was like new. Only a tiny bit of carbon built on the piston crowns, that was easily swept off with a clean rag! Piston skirts in perfect condition, rig gap almost like new! I'd like to mention here that the workmanship on this bike is amazing! I've never seen such quality on any other of my bikes (all more modern-ish than this one). So, I decided I would have a new head gasket cut, and did that at a shop that specializes in this. I had a metallic gasket made, covered with that plastic/rubber coating. While I had the cylinders off I checked the rods for play, no problem there. But the front crankcase (the one with the corroded carb) and crankshaft was flooded and showed signs of pitting. I filled it with WD4 and started cleaning with 1400 sand paper and a rag. It turned out ok, so I had nothing else to do there. Another problem that turned up was the water pump. The housing was corroded and pretty much the internal thin piece crumbled to dust. I cleaned the impeller and made a new gasket, couldn't think of any sollution at that time. Only problem that may come from that, is turbulence in the water and maybe somewhat lessened cooling ability! That's all I can remember right now, I'll come back later with more on this! How much did it cost to get a head gasket made and did the shop keep a pattern so that more can be made ? Glad you liked it mate, there'll be some updates, but not many with the financial situation being what it is in my country! About the head gasket, well, I can't remember the exact price but I think it was less than 20€. The shop kept a copy so they can reproduce it. What has to be kept in mind in case anyone would like me to get them a copy and send it, is that it has to tried and some risings and recessions (sorry for the poor use of language) can't be reproduced in this shop. Well, I haven't had any plan before writing this thread so some facts will be posted in random order. Back to the time I had taken the engine off the frame. Well, taking the engine off the frame was a PITA! I did it so I would know the process and to clean the frame, cradle and stuff! When I took the airbox out, I checked the air filter. The cage was there, but the filter itself had become more fragile than a butterfly's wings! I cleaned the remains and left it at that! Some time much later in time, I went to a shop to buy a chain slider for my WR426F. The needed part was on the same wall as the air filters. When I saw the Yamaha raptor 660 air filter I thought that it may be a good fit! Let me tell you it is! I'll get some pics in this week or the next (I am moving house so not much time!) to show you the fit. I guess it is more restricted than the original, but the few rides I had didn't show me a bad ratio. I also checked the exhaust chambers, they were in pretty good shape, only the can covers need to be replaced or maybe they actually need a LOT of elbow grease! All the electrics are in pretty good condition with the exception of the tacho (it's what shows RPM, right?) that doesn't want to show but stays up to 2000 and still not rising fast enough. Some guys told me that after a few rides it will come to it's senses so, I'll just wait and trust in them. I didn't check the rear shock, it will be one of the last parts I'm going to pay any attention to. Front forks have much pitting in the upper side (in between the clamps) but also show signs of corrosion in the usable travel. I don't know what I'll do with them, maybe change the whole front system with a GPZ600, 400 or something else era correct. I don't know if the anti dive works and really don't care. Brakes work but need some proper change of fluids and bleeding. I remember the swingarm has some scratch from the passenger's footrest touching, or the exhaust can. Everything indicates the bike has been dropped on it's right side at one point or another. Thanks StrokerBoy! I don't know if it really is more rare than all the others (greens excluded). I've never seen another for sure, but then again, I haven't seen any apart from Bill's stash. I also have to admit that I most probably won't end up with a pristine/mint/like new condition bike as paintwork is more than 2/3 of my salary and the latter seems to be barely enough to feed me, get me a rented roof over my head and pay for my transportation to and from work (I'm of the lucky ones who still have a job, official unemployment rate is 23%)! Eventually, after I re-assembled the top end and put the engine back in the frame, I filled it with gas and oil and decided I should wear me safety work shoes to try and start it. I had read all about the difficulty to start it and was prepared for some heavy sweating and swearing. To my surprise, it started on third kick. It didn't idle of course, but the joy I felt kept me kicking and doing the usual (clogging air filter, fiddling with idle screw etc) for 30 minutes! Well, the bike started and after I warmed it up, I tried to take it for a ride. I forgot to mention Bill gave me a right hand clip-on, so the only thing I really missed (and still do) is the right footrest (does anyone have any idea if it is the same as another model?). The bike stopped many a times, but patience and a strong right leg used to the hard kickstarting procedure of the notorious WR426F, kept the bike restarting. After a bit longer ride (about 1,5 km) the engine sounded crisp and revved properly! Not to mention it even started easily, on first or second kick! All the above took place from summer of 2010 to summer of 2012. Welcome to the world of the Tandem twins, Fanis. I had to replace one of my footrest rubbers a while back, and the part number was the same as the GPz600's, but I'm not sure about the actual footrest? the KR kid wrote: I had to replace one of my footrest rubbers a while back, and the part number was the same as the GPz600's, but I'm not sure about the actual footrest? Yeah, I don't know for sure, but 80's GPz bits are a good bet. Nothing wrong with tatty but original paintwork, I'd much prefer to see that instead of a pristine respray in green/white. You could always build a streetfighter version, due to the fact that most of the bodywork is missing, availability, and finances. I recall a neat bike built in Japan a few years back; I think there are pics on Strokerboy's site.